Reset all the menu and customized settings, and delete all music data on the HDD. 1. 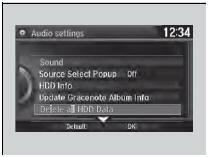 Turn on the audio system and select the HDD mode. 3. Rotate to select Audio Settings, then press . 4. Rotate to select Delete all HDD Data, then press . - The confirmation message will appear. 5. Rotate to select Yes, then press .